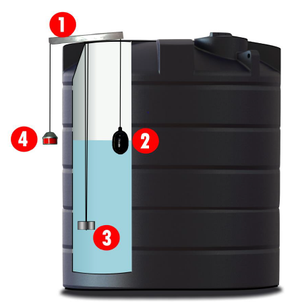 C-Level Rainwater Tank Level Gauge – Freeflush Rainwater Harvesting Ltd. 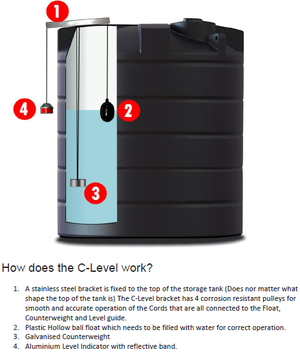 The C-level tank level indicator is a mechanical method of accurately determining the level of liquid stored in a vertical tank. The level indicator is designed for tanks up to 3 metres in height. 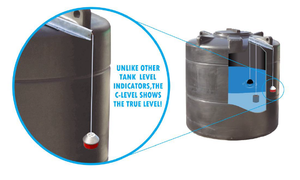 The C-level tank indicator can be fitted to all new storage tanks and retrofitted to almost any shape and size of tank. 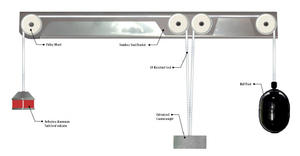 The unit consists of a counterweight, float and level indicator, all controlled by a pulley system. The float and counterweight are easily fitted into the tank and the level indicator is attached to a guide wire on the outside of the tank, moving up and down the wire in alignment with the level of the float inside. This gives an immediate, easy-to-read and accurate measurement of the content level. A fixing kit is supplied with full installation instructions and a fitting template. If an access hatch of at least 200mm diameter is present, the C-level indicator can be installed without the need to enter the tank. It can be fitted to tanks with a sloping roof, up to an angle of 40 degrees.